If you have been in a situation where your home or business keys got broken as a result of mishandling or thieves damaged your house keys and broke into your residence, this might have prompted you to consider changing your key locks. Most people in this situation do not even know that there is a better and cheaper option of re-keying their locks, rather than changing it completely. Well, you may want to ask why this is so important? The answer is simple because you will be saving a lot of money in rekeying. Most locksmiths take advantage of the fact that people are not aware of the differences and rather than making them know the options, they recommend the costly option for their customers. This article will give you the insight to determine whether to ‘’re-key’’ or change your locks entirely. First, let us know what re-keying a lock means. The process of changing an old lock with a new one is self- explanatory but rekeying a damaged lock requires some explanations. Now, to rekey a lock, the locksmith needs to have its matching key. Without the matching key, the only remedy is to pick it open, which might not be a problem for an experienced locksmith. What it requires is an extra cost which can be costly than changing the entire lock. It is ideal to know that rekeying will not distort the security of your lock, neither will it make it more secure. What actually guarantees a lock to be secure is the number of pins in it. Therefore, it is only when the locksmith swaps the old pins with the new ones that the lock becomes better. Why Re-keying is a great solution? The reason rekeying is cheaper is because of cheap key pins. This method will only require you to pay for labor, whereas when you change your locks, you’re paying for both parts and labor. One important feature to note here is that all the locks come with an option to rekey. This helps you to clear every doubt whether you need to rekey or not. 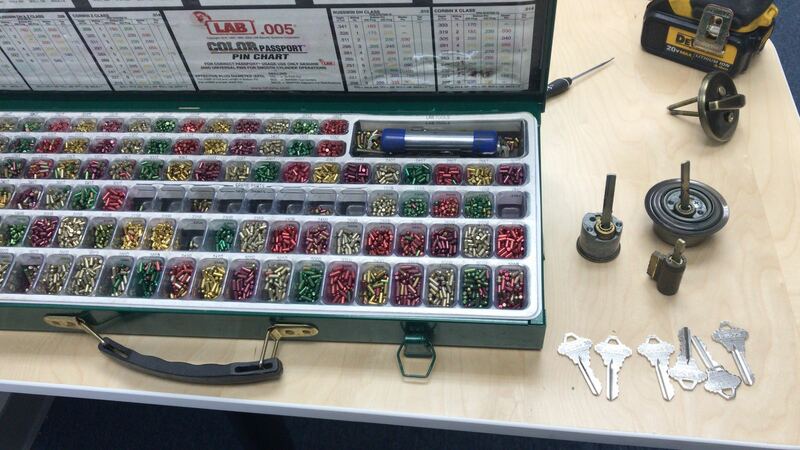 However, the method of re-keying different locks is never the same because they make use of different tools. Changing a normal house key can be done with a good screwdriver. The task does not require serious learning but needs you to have the right equipment, which may be expensive though. You can find nice pinning tool that can re-key most locks for two hundred and fifty dollars, which invariably costs more than ten key locks. Well, in all of these, one amazing thing with this rekeying idea is that there are new types of locks that offer an option to easily rekey, without talking the lock to a locksmith. Locks like Kwikset smartkey are increasingly becoming popular as technology advances, even when they can sometimes develop faults. Conclusively, comparing the differences between re-keying locks and changing locks, I’ll recommend a re-key, especially if you know how to do it. Moving in a New Home/Office/Business? Call a Locksmith! The agreement has been signed and you are now the proud owner of a new home, office, or business property. Congratulations! The whirlwind associated with moving into a new property usually makes it easy to overlook the need to change the locks, but thinking about the number of people that may already have your duplicate keys is frightening already. For the safety of your family and valuables, we recommend that you change the locks. Moving into a new property can be a very exciting, yet stressful experience so it is hardly surprising that some may overlook changing locks as an important task. While the previous occupants of the property will present the set of keys attached to the property, it is very unlikely that you know exactly the number of keys that were available in the set unless they were people you knew and trusted.. If the locks are not changed after moving in, you would be exposing yourself, loved ones, and your valuables to burglars. Glendale Locksmiths can replace locks on doors in residential apartments, offices, or commercial properties. We provide our professional services 24 hours a day, for 7 days a week – and can schedule a visit at any time of your convenience. Our services are extensive and tailored to your specific needs. When you move into a new apartment, office, or business location, there are lots of factors to be considered for the security of your property. Of course, you would want the best locks for all of the doors. Our understanding of the functioning of different lock systems ensures we are able to access key areas of the property and determine the lock that best fits a specific area. At Glendale Locksmith 24, our services are tailored to fit your needs and budget – we are your one-stop shop for all your lock and key needs. We understand that every home, office, or business would require different levels of security – and you can count on us to provide only the best for your property. Are you moving into a new home, office space, or commercial property? Glendale Locksmith 24 provides the specific solutions to your security needs. You can rely on us to provide fast and professional locks changing services as we are available at any time of the day. Feel free to contact us at (623) 404-1330.